We’ve been in Ireland now for two months of house- and dogsitting. It’s been an adventure! Here’s a recap of the highs and lows, plus a hint of what’s to come. 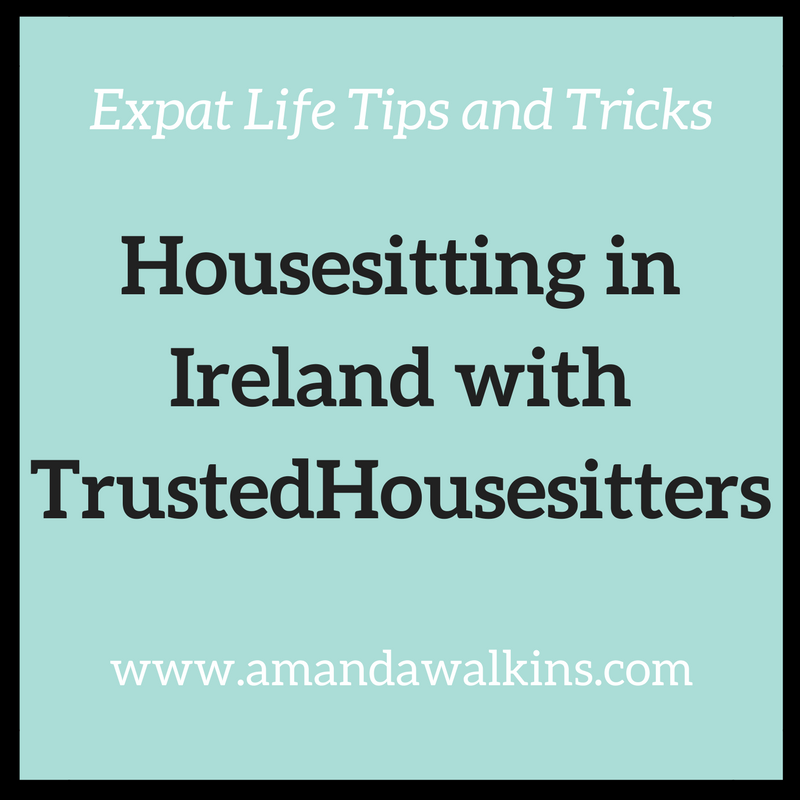 Housesitting in Ireland with TrustedHousesitters has been an incredible opportunity, but nothing is ever perfect! Housesitting with TrustedHousesitters typically entails petsitting as well. There are very few housesitting listings that don’t include animals. Usually, it’s dogs or cats, but sometimes other farm or exotic animals as well. Our housesitting gig includes just one puppy on a huge plot of land in the Irish countryside. It is stunning! For the record, sunshine is not normal here. The only photos I have are sunny ones from the handful of days I dared take my phone out of my pocket! The home we’re in is actually an old stud farm, meaning they bred horses here. The owners are in the process of building the farm back up after years of letting it lapse. Because of that, there is a lot happening with major overhauls within the main house, plus endless plans for the land and the farm. Part of the farm is rented out to an equestrian school and also has lots of sheep. Sheep, come springtime, also mean lambs! Right now we have lots of little lambs out in the fields around the house. In fact, we watched triplets being born in the barn and taking their first steps just in front of us! The one on the right is about an hour old, the other two had just been born minutes earlier. I am physically restraining myself from snuggling them! There are horses all around us, cows in one of the fields, and sheep everywhere. Then there’s the fluffy puppy we’re looking after, who loves to bark at every single one of those animals and chase the sheep every chance she gets! She also loves to snuggle up on the couch, keeping me warm in this cold climate. Moving to Ireland was easy for us since we were coming from Scotland. This was a 6-month housesitting assignment, which is actually the longest we’ve ever maintained any apartment lease (in Roatan, we just kept renewing our 6-month lease for a few years). So, for us, this was as close to a permanent move as we ever do! We also hoped to stay in Ireland once the housesitting gig was done. We aimed to use this as an opportunity to scope out jobs and places to live in different areas. Six months is enough time to settle into an area, learn and explore, and also to know if it feels like home or not. For us, sadly, this just isn’t home. That’s despite the fact that this was actually a homecoming decades in the making for my other half. He was born in Dublin but hasn’t lived here since he was two. While many expats absolutely adore life in Ireland and can’t say enough praise for the country, we’ve hit one too many roadblocks that make life a bit too difficult for us to stay. Frankly, the cost of living is generally high. Dublin has a housing crisis so the rental market is dire, even out as far as we are from the city. The kicker is that you can find lower rents out here, but then car insurance is abysmal. All this and wages offer no match to meet needs. It’s a wonder anyone can make it here! Add in the notorious climate and, for us, the struggles are just not worth fighting against here. It’s unfortunate because my other half was able to quickly snag a fantastic job and he is loving it! But as much as he loves the gym he’s at and all the personal training clients he’s already acquired, staying here simply isn’t a good option for us. Look how adorably happy he is! He offers online personal training, too, if you’re interested…click on the photo to check out his site. A huge part of our decision to leave was the extreme difficulty we faced in trying to insure a car. Given that we’re out in the countryside, living without a vehicle isn’t really an option long-term. Yes, there are buses. They run about once an hour and tend to be about 20-30 minutes late, although occasionally they’re on time (ish). I’ve stood at an uncovered bus stop in the pouring rain for upwards of 30 minutes far too many times. I ended up getting our groceries delivered because the delivery fee costs far less than the bus and taxi roundtrip. But never leaving the house is incredibly isolating – despite the many fascinating conversations I’ve had with the menagerie on our land. For anyone considering moving to Ireland, a quick note about car insurance. If you have not had Irish insurance for the past two years (and that includes Irish citizens! ), you will start as a new driver for insurance. While that may not be catastrophic elsewhere, here, that means a laughable rate. I cannot count the number of locals I’ve talked to with crazy stories to tell. The cafe owner’s middle-aged brother who went to Australia for 2 years and came back home to be charged over €2,500 for car insurance. The taxi driver whose car insurance went up 70% in one year. The other taxi driver whose insurance doubled between 2015 and 2016! There was the guy who drove a corporate car with no claims for over a decade, only to be told he had no personal driving record so was quoted as a new driver when he bought his own car. That same situation happened to our family member, too. These are Irish citizens who are being dramatically punished by car insurance companies. It’s just wild! Neither of us has an Irish record. However, we both have completely clean driving records – mine for 14 years. Also, the company that insured me most recently in the U.S. works here in Ireland as well. With all that, the best annual quote we received was €5,500 for third-party coverage. For the record, that’s precisely 10x higher than the rate we received for the exact same vehicle and driver details in the UK. TEN times. The company I had a connection with refused to even offer insurance because we exceeded their maximum (in case you’re curious, that maximum is €6,000). We were also flat-out turned away at other insurance companies. We tried filing an official complaint with the ombudsman, but we were told it could take months to handle because their office was overwhelmed. Even if this were a feasible payment for us to make, it seems absolutely outrageous to spend that much just on insurance. Then add in annual road tax (ours would’ve been €800), general maintenance, and fuel…that’s a hefty price tag for just getting around! BootsnAll offers a round-the-world (RTW) flight search option. Here’s the completely random search I just did right now. We could do this trip together and still have €2,500 left over to spend before paying the cost of a car in Ireland for one year. Wow. Ummm I think we’ll take international travel, thanks! Life here can be fabulous – especially for us since we have family here! We’ve been able to do family dinners, birthday parties, and nights out in Dublin with cousins. One of my best friends also travels to Dublin for work regularly, so I’ve been able to see her for dinner and drinks and life-saving chats (never, ever underestimate the power of friendship). We have a network here already, which always makes an international move easy. However, a move to Ireland is truly easy for most expats anyway. The people are famously warm and welcoming. You can strike up a conversation with strangers everywhere you go and nobody will think you’re weird. In fact, you will be weird if you don’t chat with the bus driver, your seatmate on the bus, the cashier at the store, and the bartender at the pub. Conversation is an art form and a way of life in Ireland – so never fear that you will be excluded or lonely here, especially if you speak English! There are also tons of international language schools in Dublin. Even if you come here with limited English you’ll be able to easily join a social group that’s also trying to learn. Other than fitting in and the cost of living, Ireland is easy to understand and to navigate as an American expat. Adjusting to expat life here is simple, which is why it’s such a popular destination. Just be forewarned about costs and make sure you’re ready to dish out hefty payments for your first few years here. Another reason to love expat life in Ireland? Daffodils in February! They bloom everywhere and you can’t help but smile looking at them. So once we’re done housesitting in Ireland with TrustedHousesitters, we’ll be moving on once again. We aren’t bound to stay here with any anchors – no mortgage, no kids, no career path confined to the country. Because we have options, we’re seizing them. We’ll be moving on again to see if the next spot fits us a little bit better. That’s the thing with expat life…you’re not taking a leap of faith that might plunge you toward your death if it goes wrong. Rather, you’re just hopping along on rocks in a stream. You might stumble, you might even fall and get wet. But you can just keep going to the next rock until you find the right path for you. Remember when we couldn’t plan for certain aspects of our expat life in Scotland (basically just Brexit and its dramatic impact on us as resident non-Brits)? Well, we were unprepared for a few things here as well that were out of our control. And the car insurance issue was definitely a surprise. Knowing the industry here, we anticipated a high quote. But you can’t find out actual numbers until you have a vehicle to provide the specs. Thus, we bought a cheap car only to find out that no reasonable quote could be acquired. But flexibility is key to expat life! If you can’t roll with the punches, you’ll get knocked out. Housesitting has offered us a fantastic opportunity to try out expat life here in Ireland, without signing a lease or being bound to stay longer than we really want to be here. Beyond being a great way to travel and stay for free, like I did in France a few months ago, housesitting is truly the best way to test out expat life! A few months in an actual home living like a local lets you figure out if this place is right for you or not. Plus, you get to practice driving on the wrong side of the road on really narrow winding streets lined with ancient stone walls…so everybody loves that! He is not amused by my enthusiastic driving on the wrong side! No cars were hurt in the making of this photo. We are so lucky to have had this opportunity to try out Ireland. We also learned some valuable lessons with this particular move, but nothing that we can’t recover from quickly! Speaking of quickly…stay tuned for more details on where we’re headed. It’s coming up much more quickly than you might think! We won’t be staying here for the full original housesitting assignment. We had intended to stay until the end of June. However, the homeowners’ situation changed quite dramatically, so they aren’t in need of a dogsitter (and, in fact, never were). Since they don’t need us here and we definitely don’t intend to stay after the original end of our agreement anyway, it’s time to move on! We’re ready to hop to our next rock, so plans are already in motion. Disclosure: Links on this site may be affiliate links, which means I receive a commission if you click and purchase anything. It adds no cost to you, but it helps me pay my bills. Apparently, you can’t trade coconuts or banter for electricity…it’s most unfortunate. For more details on how affiliate links work, click here. Stay updated on our adventures on Facebook, Instagram, and Twitter. You can also subscribe to my newsletter to receive posts straight to your inbox.